“Lucretia Mott: Friend of Justice is the life story of a 19-century white Quaker woman minister, teacher, abolitionist, and leader of the Pennsylvania Peace Society…Lucretia Mott worked to abolish slavery, provide equal rights for men and women of all races and for world peace. She was a friend to such legendary figures as Sojourner Truth, Frederick Douglass, and William Garrison. She even defended John Brown, the white abolitionist who tried to raise an army of escaped slaves to overturn slavery, which eventually cost him his life. “For it is not John Brown the soldier we praise, it is John Brown the moral hero….I have no idea because I am a Non-Resister of submitting tamely to injustice inflicted either on me or on the slave. I will oppose it with all the moral power with which I am endowed. I am no advocate of passivity. Quakerism as I understand it does not mean quietism. 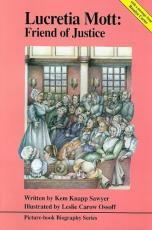 The early Friends [Quakers] were agitators, disturbers of the peace, and were more obnoxious in their day to charges which are now so freely made than we are,” she told a friend in 1859 who had accused her of being “the most belligerent Quaker” he had ever met. Sawyer does a superb job of capturing the passion of this fearless woman. Mott’s anger is almost tangible when she rails against the injustice around her, especially when it involved Blacks and women.